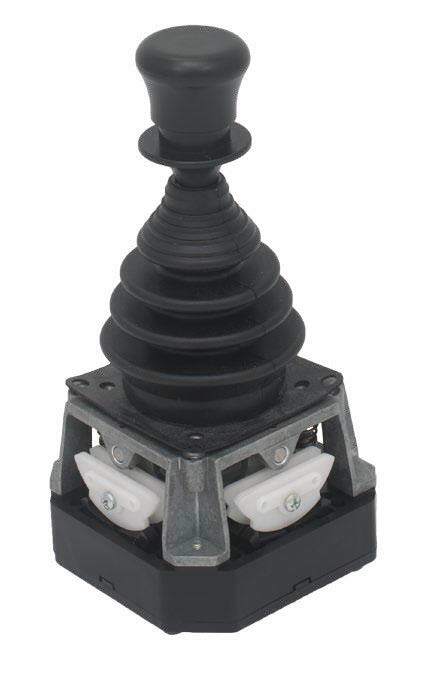 Joysticks and Joystick stations are commonly used to control industrial and construction lifting cranes and hoists. Specifically, gantry cranes, track cranes, jib cranes, wall-mounted jib cranes, tower cranes and winches can all be controlled using joysticks. Springer Controls offers two types of joysticks and two types of joystick stations. The Romeo joystick is the larger of the two. Larger joysticks can provide more precise control and flexibility, but require more space. The larger size also provides more customization flexibility. The Romeo is available with up to 6 speeds for each direction. 3 different handles are available and can be combined with pushbuttons or selector switches. The Romeo joystick station utilizes the Romeo joystick(s) combined with a customized variety of selector switches, push buttons and indicators to provide complete control to the operator. The Juliet joystick station utilizes the Juliet joystick(s), combined with a customized variety of selector switches, push buttons and indicators to provide a compact and cost effective control station.